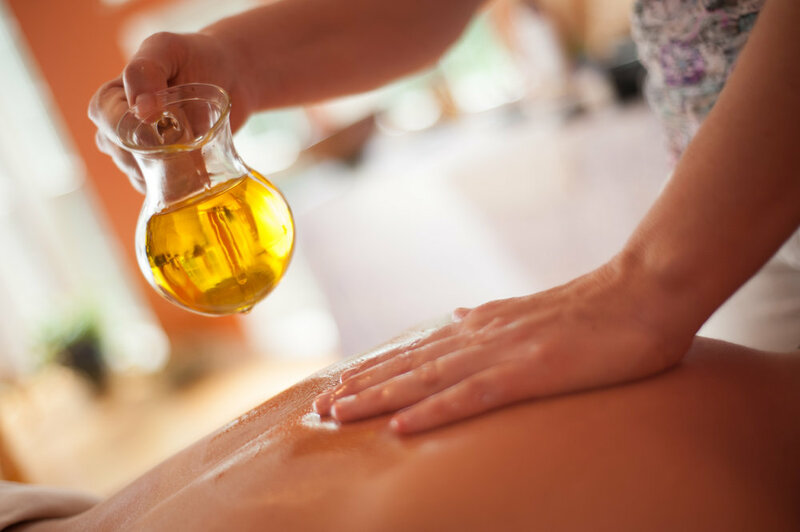 Abhyanga is a restorative warm oil massage that utilizes doshic specific herbal infused oils. It facilitates the release of stress from the nervous system, supports circulation, as well as, the dislodging and elimination of metabolic impurities held deep in the tissues. This therapy nourishes the body, mind & spirit. Shirodhara Instills profound peace with the streaming of warm oil over the forehead. It pacifies the active mind, releases mental stress and takes the relaxation of the massage to a greater depth. You’ll leave grounded and calm. Swedhana is a therapeutic heat treatment. You’ll have your choice between the steam tent or infrared sauna. It encourages elimination of metabolic impurities, traditionally following Abhyanga, taking the relaxation to a greater depth. This session includes check in/out times. Please bring a scarf or towel to cover your head for the trip home. It’s recommended to follow this treatment with quiet down time. This divine treatment includes a 75 minute Abhyanga warm herbal oil massage with heated stones. You’ll have your choice between the steam tent or infrared sauna as the Swedhana treatment after the massage which further encourages elimination of metabolic impurities and takes the relaxation of your massage to a greater depth. This session includes check in/out times. This stress releasing treatment begins with a full body massage including extra emphasis on the shoulders, neck, and facial relaxation. Next is Shirodhara, a treatment that instills profound peace. Experience the streaming of warm oil over the forehead, which pacifies the active mind and truly relaxes the body and spirit. This session includes check in/out times. Please bring a scarf, hat or towel to cover your head for the trip home. Abhyanga is a pacifying massage utilizing herbalized, nourishing warm oil that penetrates deeply into the deeper tissue layers. This treatment supports the calming of the nervous system and the dislodging of toxins for elimination. The 120 minute Deluxe Session is a super blissful treatment which includes the relaxing combination of Warm Oil Massage, Warm Stones, Facial & Head Massage. 120 min session includes a 90 min massage, integration and check in/out times. 90 min session includes 75 min massage and check in/out times. This Shiroabhyanga & Naysa combination treatment includes: a warm oil head massage followed by a chest/facial steam, and Naysa oil application to the nasal passages, as well as a marma facial massage. Very relaxing and effective for stress relief, TMJ, and allergies. This session includes 60 min massage and check in/out times.